The old school finally closed its doors to students at the end of the school year in 1969, the old school building was renovated and modernised and became the Parish Hall or Community Centre. It was officially opened in November 1975 and was the hub of most activities in the parish, with concerts and plays being staged there. The opening of the new school in September 1969 was fulfillment of a long cherished dream, and year of hard work. The man who did most to see this dream come true was the local curate Fr J.L. (Lory) Kehoe, who served in Ballycanew for ten years and had been transferred to duty in St Peter's College just a week before the official opening. Fr. Kehoe was present for the opening ceremonies and warm tributes were paid to him for his work, while the new curate, Fr. John Nolan, celebrated Mass in the new building. 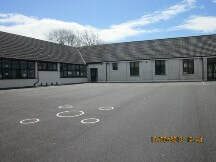 The school was opened by Donal Uas. 0 hUllachain, Chief Inspector of Primary Schools, and it was blessed by Most Rev. Donal J. Herlihy, bishop of Ferns. The new school was in stark contrast to the old - modern and airy, it boasted central heating, full sanitation facilities and all mod-cons. It had a tennis court in the grounds which could also be used for basketball. The first teachers were those who came from the old school to the new - principal James Lucas, Mrs. Mary Kinsella and Mrs. Kathleen Redmond. The new school cost the princely sum of £15,000, and was built on a site provided by local merchant and farmer, Michael O'Brien. The local contribution, which had been painstakingly collected on a weekly basis over many years, and through a series of fundraising field days and other events, was already paid in full. 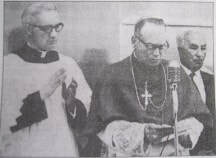 Praise was given at the opening to the generous response to fundraising by the non-Catholic people of the area. Shortly after the new school was built, the County Council went ahead with the 44 house Ounavarra Estate which brought a lot of new people and young families into the area. It is ironic that within very few years of its opening the new school was overcrowded and extra space was needed. 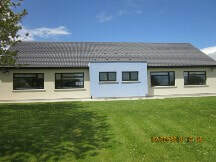 The school is situated at the entrance to Ballycanew village on the R479, 8km from Gorey. The community is very involved in all aspects of school life. The children attending the school come from a variety of backgrounds – farming and commercial. All of the parents are very supportive of the school and its policies. A large proportion of the school population is new to the area. The pupils of the school are predominantly but not exclusively Roman Catholic. The school building is used by the community to facilitate meetings and extra curricular activities. 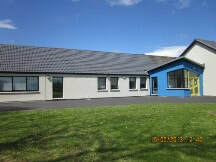 Ballycanew National School is situated in the centre of the village, which is part of Camolin parish. The old school house (Community Hall) was built in 1901 . The school moved to the present building in 1969. An extension of two classrooms and an Assembly was added in 1981 making it a five teacher school. A prefab was purchased in 2003 to provide for a sixth teacher. In 2004 a portacabin was purchased to cater for the needs of Learning support. A section of the Assembly Hall was also converted into a staff room the same year. A two classroom extension was constructed in 2011, at which time the BOM invested in a total refurbishment of the school which was badly needed. In 2014, a further extension was added, where our 3 classes for Children with Autism, school library, sensory room and Occupational Therapy room are based.